Arginine is considered a non-essential amino acid, although research suggests that it is essential in certain conditions where the body would not be able to synthesize it in sufficient quantity, such as as it happens in stages of rapid growth, you trauma and other physical stresses. For this reason, research on the use of arginine supplementation has been to assist in the recovery. The body uses arginine to synthesize nitric oxide (ON), a substance that relaxes the blood vessels, which converts to arginine in a prominent factor to promote the proper maintenance of the blood flow throughout the body. 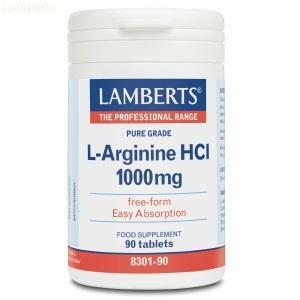 Therefore, arginine plays an important role in cardiovascular performance. Given that arginine participates in the release of the growth hormone, this amino acid is also necessary for growth, while also involved in the body elimination of ammonia, a waste product of the metabolism of nitrogen. Arginine is found in foods such as dairy products, meat, poultry, fish and nuts, but in fruits and vegetables is present in generally low amounts. The LAMBERTS ® L-arginine is a pure amino acid in free-form that is ready to be absorbed by the body without having to be degraded by digestive enzymes. 1 to 4 tablets daily. It is preferable to take the amino acids with fruit juice or water, better than milk. Amino acids are absorbed better if taken half an hour before any food or sleep. agents in charge (calcium carbonate, cellulose), modified starch, agent coating (Hidroxipropil Metilcelulosa, glycerine), anti-caking agents (silicon dioxide, stearic acid, magnesium stearate).